Ideen have unfortunately discontinued their range of wool scarves. Many of our customers are making their own from Ideen's Wool Etamine, available in our fabrics by the metre section https://www.rainbowsilks.co.uk/ProductDetails.cfm?SubCatId=91&Code=IDE11701 which is 150cm wide. The Ideen scarves were 180 x 45cm, with the short edges unsewn and fringed, and the long edges hand-hemmed. 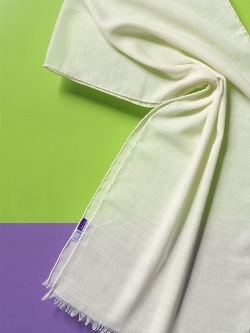 You could also machine hem, or leave all edges raw and take out a few rows of thread to make a fringe. If you purchase 2 metres you could get 3 long scarves of this size from the piece.